My family hosts the annual Chanukah party for my husband’s siblings and their children. Aside from frantically cleaning the house, I’m planning a short program. Almost everyone likes to play games, and they are a fun way to get to know my nieces and nephews. No more than a half hour of preparation before the party, and no expensive equipment. Easy entry—i.e. simple rules that even children can understand. Multi-level. Children should be able to compete at a similar level to adults. Simultaneous participation. Everyone should something to do at all times, or have some action to watch. Suitable for indoors, depending on your setup and the weather. Suitable for the native languages of your guests. No set number of players. The game won’t be ruined if someone quits in the middle. What’s not important: Winners and prizes. As the Wind Blows. My 11-year-old daughter found this somewhere. It’s a simple game that kept the group of about 20 (not many little kids at the moment) interested for well over an hour. Sit in a circle, with enough chairs for all but one. One person stands in the middle and says, “The wind blows over everyone who . . . (is wearing stripes, was born in Israel, played chess today).” The person in the middle must be included in the category. Everyone in the category has to get up and switch seats, and the one without a seat takes the next turn. This was a good-natured group that knew each other well. Everyone pretends to be five years old, or that it is 20 years from now. They pretend to be Queen Elizabeth, or the person on their right. The answers start with a vowel, or contain a number. They cross their legs before giving the answer. If a patient lies, as needed when the answer will give away the affliction, everyone shouts “Psychiatrist!” When the psychiatrist has guessed or given up, someone else takes a turn. Mafia. This very popular game requires a little time to understand the rules. But if you act as Narrator and direct the activity, people will catch on. Each person is assigned a role at random, with two or three becoming the Mafia. They secretly “kill” victims one at a time. The townspeople win by figuring out the Mafia members before everyone gets killed off. See Mafia on Wikipedia for complete rules. Charades. In this classic party game guests act out scenes or phrases without speaking. We’ve done it with scenes from Tanach (bible). Kids love this too. Here are instructions if you need them. Pictionary. You need a whiteboard or large pad of paper at an accessible height. Players take turns drawing a picture of something and everyone has to guess what it is. Here’s a sample list of words to draw. Of course you can choose a Chanukah theme. Memory. Collect 20 or 30 small household objects on a tray, and cover the tray with a cloth. Pass out paper and pencils, then uncover the tray for one minute. Afterward, each player writes as many objects as they remember. Trivia. This works well if you don’t have a lot of smaller children or they are involved in another activity, because if the answers are too easy or hard people get bored. Or you can split into different age groups. I found this list of quizzes and easy crafts for kids (Hebrew). Family Trivia. One year we asked everyone to list all of the cousins by age. You could add birthdays, include extended family who aren’t present, or details like schools, favorite foods, professions, etc. Interview. This isn’t technically a game, but it worked wonderfully at an event I recently attended. Interview an older family member, trying to draw out stories of what it was like in the “old days.” You will need to prepare the questions and possibly review them with the subject to make sure the material is interesting. What games have you played at your holiday parties? I see noble intentions on your suggestions. Have in mind that the thought should be related with the battle and history of Hanuka in order to arouse the same influence on our lives in our days (gadol a limud she mevi lidei a maase). The activity after candle lighting is part of a ritual The activities you describe may be great games it seems not to resemble that, they look like mere games. Please reconsider your suggestions. Abe, most of the games included suggestions for Chanukah. I’m not sure what you would choose instead? At any rate, I don’t expect readers to adopt everything I suggest. Take what you like and leave the rest. the custom of sevivon is to recall that kids would study torah and pretend they were playing sevivon the suffaniah is to recall the miracle of the oil (mishna brura). These simanim will attract miracles in our lives. 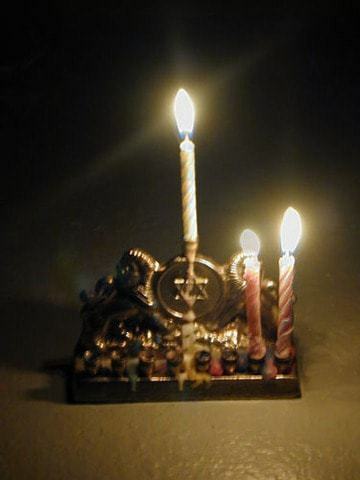 Remembering cousins may attract unwanted visits instead of chanuka miracles. So you only eat sufganiyot during the chag (and latkes) I presume? Abe, are you saying that during Chanukah you can only do certain activities? or only during candlelighting? I’ve never heard either. At our family Chanukah parties, we often play some variation of Family Trivia. And Pictionary is always a highlight of our Purim seudahs. We have a whole batch of Purim-themed clues – ranging from very easy ones (e.g. “ra’ashan”) for the littlest kids to extra-challenging ones (mostly obscure phrases from the Megilah) for the older players. Great, Mrs. S., you should publish them in time for Purim this year. If you want to guest post with ideas for Chanukah, let me know. We have more little kids at our gatherings and I’m not good at game planning but I like to keep projects everyone can participate in when gathered together. I pre-make sugar cookies in Chanukah shapes and keep a bucket of colored sugars, sprinkles frosting and such for everyone to decorate (we’ll be doing this tonight). Or have pre-cut construction paper forms and a box of tissue paper or other scraps for making decorations for our home or have the kids come up with one simple project and teach everyone else. Kids get focused on using their hands and their creative juices and adults get to be crafty and chat. It’s not competitive and people have fun when its open ended. PS. I like the idea each family coming with a prearranged talent or skit to share that includes all members. I love your games… we are definitely going to play some of these… It is that time of year where we linger a bit longer at the table after dinner (it is just too hot to rush off to bed!!!)!!! This is a great list thanks for compiling! Most of these games work on Shabbat also. I like playing games with my kids when we are walking far. It helps take their mind off the treck. My kids are 4 and 5, so we play geuss that fruit or veggie. One of us say something like, “I’m thinking of a fruit that starts the the letter ‘K’,” and then we take turns asking questions about it’s color size, etc. Even my mom had fun. Thanks for the ideas. My daughter is hosting a Chanukah party on Sunday morning, though I think she has enough planned on her own (or with her friend). But my son did create a treasure hunt for them…you need someone creative to come up with the clues, but it can be a way to have fun in little groups. Easy or hard depending on the crowd. How did it go, Leora? The treasure hunt went well! My son wasn’t home when the girls did it; so when we got stuck, we called him twice on the cell phone. great ideas for any family party and easy to adapt to a particular faith or holiday! !